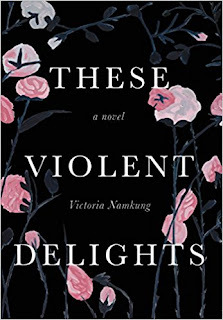 Well, the upcoming release of the novel, These Violent Delights, by Victoria Namkung could not be timelier. Women all over the world are using the hashtag “Me Too” to make the world aware of the prevalence of sexual assault and harassment. Dozens of celebrities are naming Harvey Weinstein’s abuse of women. Kevin Spacey is currently in the news for his behavior towards an underaged boy. So, this book is coming out at just the right time. These Violent Delights delves into sexual abuse issues within an elite private school setting. After a young journalist pens her story about her male teacher coming on to her and her requests for help from the school being dismissed, other women come forward with their own stories about the same teacher. The problem is that this teacher has a fantastic reputation. He is a stellar teacher, a husband, a father, a churchgoer, and apparently, a man who preys on young women. So, the school decides to keep him in his respected position rather than listen to the initial student who accuses him of misconduct. (Don’t think this happens? It does.) This novel revolves around the young journalist, her mentor at work, and two other abused women working to bring him down. For me, this story read more like nonfiction than fiction simply because this type of thing happens all the time. All. The. Time. I can use the #metoo hashtag, as well as many of my female friends. So, the book, while fictional, was just a reminder of the stories I’ve lived or the stories I’ve heard. The author does a wonderful job of showing just how easily we dismiss these types of occurrences and why it is so dangerous. It will make you think twice before you try to ignore or dismiss these claims in the future. And, if that is the author’s whole point, then good for her! However, I will say, I HATED the ending. HATED IT. I should have known when the title comes from Romeo and Juliet quote “These violent delights have violent ends” that I would not like the ending. But, I still was not prepared. And, it felt icky. But, I think the ending is designed to make you talk. The best books cause reactions. This one could not come at a better time. Thank you, NetGalley, for providing me with a copy of this book to read and review honestly. For those interested, you can pre-order the book here or by clicking the book cover. *These are affliliate links. Thank you for supporting my blog!